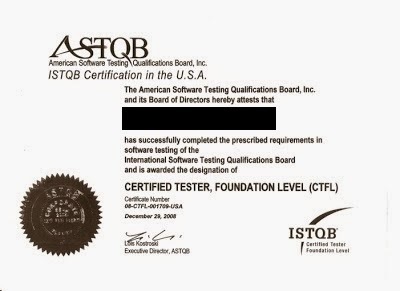 Around the same time that the #stop29119 campaign was being organized by the Context Driven Testing school of thought, a Professional Testers Manifesto was issued by the same school via Karen Johnson's blog post titled My Thoughts on Testing Certifications. Below is the manifesto's text in its entirety. That standards compliance is no substitute for knowledge and skills, and that possessing a certificate demonstrates neither. That companies have been convinced that only certified testers should be hired. That organizations who use certification as a surrogate for rigorous selection processes place the quality of their testing at risk. That organizations who make money from creating or promoting standards and certifications are biased in their thinking by the potential financial rewards of convincing organizations that only certified testers are professional testers. Those organizations may include those who sell training, consulting or other related services. That testing benefits from diversity and not homogeneity: that testing is not a profession that can be standardized but instead needs to remain an intellectual professional activity. That choosing not to be certified does not mean I do not take my profession seriously. It is because I take my profession seriously that I choose not to be certified. As soon as I read the first two sentences, I knew that this manifesto did not resonate with me. As I read on it became apparent that this was a continuation of the #stop29119 campaign, extended to certifications and training. It is basically a set of sentences that concentrate on discrediting as well as bashing the current certificate programs and their bearers. I was expecting to find, in this manifesto, a call to unity. A call to our sense of pride and professionalism that all testers, from all schools (and even the free-thinking ones that don't choose a school) can feel proud in signing. Instead what I found was yet another list of complaints against the standards and certification folks. And that, I don't subscribe to. Below is my reply to each point in the manifesto. My responses are in italics. A. I find this interesting. Because this can be taken many ways, depending on perspective. But my main gripe is why is the word 'professional' included here? Are there testers that are not professionals? Do I have to sign the manifesto to be considered a professional? 2. That standards compliance is no substitute for knowledge and skills, and that possessing a certificate demonstrates neither. A. Why do I have to declare this? Is this not known my folks in our profession already? And if not, how many do not know? The answer is that we do not know the answer. So one cannot assume that people do not know this already. 3. That companies have been convinced that only certified testers should be hired. A. Really? I've worked at many companies that never even heard of classes (ISBT, RST, etc) and courses let alone of a certificate. How can we assert that companies have been convinced of this? 4. That organizations who use certification as a surrogate for rigorous selection processes place the quality of their testing at risk. A. Again, why do we have to declare this? An argument can be made that companies that don't know any better can be biased by a certificate and probably no one can refute this. However, this does not invalidate courses that end up in certification. 5. That organizations who make money from creating or promoting standards and certifications are biased in their thinking by the potential financial rewards of convincing organizations that only certified testers are professional testers. Those organizations may include those who sell training, consulting or other related services. A. 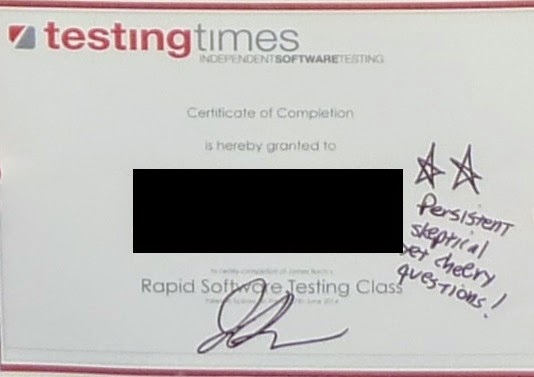 Of course a company that promotes standards and certifications would be biased in their telling their customers that they should hire certified testers. Just like the folks against certifications (mainly the CDT school) are biased in their telling their customers that they should hire CDT school of thought testers and not certified testers. 6. That testing benefits from diversity and not homogeneity: that testing is not a profession that can be standardized but instead needs to remain an intellectual professional activity. A. This echoes the stop29119 campaign. Tell me, fellow testers, how many of you do not know that testing benefits from diversity? Even if the manifesto is aimed at non-testers (i.e. managers, hr, etc) we're talking about common sense. Any human understands this concept intuitively as well. 7. That choosing not to be certified does not mean I do not take my profession seriously. It is because I take my profession seriously that I choose not to be certified. A. This statement implies that the folks that are certified do not take their profession seriously. Is this the message we want to convey? I find the Professional Testers Manifesto not to be inline with my values nor with my mission as a tester. I see it as another attempt to further polarize a community of very talented testers and engineers; and this does not serve any of us in the end. Why should we have to choose a side? There are many of us that do not feel threatened by standards nor certifications. There are many of us that view these courses the manifesto is speaking of (whether they lead to a certification or not) to be valuable source of information, skills, and knowledge. Another weapon in your arsenal of test tools. Another perspective, if you will. This manifesto that claimed to be for all testers, IMO, really should have been called the Context Driven School of Thought Professional Testers Manifesto. I am a professional tester and for the reasons given above, I abstained from signing the Professional Testers Manifesto. First off I'd like to point out that I, in no way shape or form, support shady practices of _any_ consulting firm or training center that sells "certifications" without "education". In other words I do not support testing houses that are just teaching to pass a test and issuing out certificates to students that want / need these certificates in order to gain employment, advance their careers or whatever it is they do with these things, and not actually providing an education. I am for and do support continuous learning, teaching, mentoring and advancing our community in any positive way that I can. That being said on to business: what is the difference between the two certificates you find below? Now I am not just talking about the obvious differences; that one is from the ISTQB and the other from the CDT folks. I am also aware of the syllabus differences, not talking about those either. I am more interested in what is the underlying principle behind both of these certificates? In other words the why. My gut tells me that these are just two pieces of paper that probably mean something just to the bearer. But, they can also probably be used by the bearer to gain access to special clubs (probably some of them even have secret hand shakes). Or to flash at an interview in order to impress your employer and gain "favorites" when it comes down to choosing the "right candidate". Heck you can even add this to your resume / CV in bold letters so that, before the interview, you can let prospective employers / interviewers know which "special club" you belong to. These are but a few of what I think are valid uses for both of these certificates; as any other certificate. But isn't the difference in underlying principle between both of these courses that there is no difference? Are both courses not teaching (or supposed to be teaching) skills, terminology, etc that will not only improve the knowledge of testers but also benefit their employers and customers? Are both courses not giving you access to a network of other like minded individuals that also share a common love for testing and our profession? Although folks have been talking about ISO29119 and its possible impact on the testing community for a while now, it wasn't until this past August at CAST 2014 that the issue really took off. James Christie, one of the speakers at the conference, gave a presentation regarding his opposition to the standard. This action is what I consider the catalyst for the opposition that has followed since then. But why the opposition? And why now? These are but a couple of questions I will try to answer during this writing. The main opponents of 29119 seemed to have gathered around the newly formed ISST whose mission, as stated on their website, is to "Advocate for the adoption of context driven testing". I have not yet found any opponent to 29119 that were not a member of the Context-Driven school of testing. And if there are any, they have not been vocal as of yet. In order to understand the opposition, one has to do a little bit of research and go back in history (not that long just a few years). I have observed that there always has been conflict and friction going on between the ISTQB and the CDT folks. And since the creators of the petition feel that there is a link between the ISTQB and ISO29119 they must oppose it. Evidence of this as well as this opposition has been brewing on many social circles including LinkedIn and Twitter just to name a few, just do a search on any of these mediums and you'll find plenty of lively debates on the subject. In all of the conversations I follow on social media and read on blog posts from the many members of the CDT the common theme is basically the same; we must oppose the standard because we cannot standardize testing. They basically just oppose it but do not offer an alternative. This leads me to believe that they are opposing it because they must! Picture here in the USA you are a member of the Republican party and they propose a bill. The Democrats will review this bill and decide they are against it and request that all members of their party vote against this bill. But wait, what about all of the members of both political parties individual opinion about this bill? Well, that doesn’t count as much as the greater goal: to advance the parties political agendas. Quite frankly the reason this petition to #stop29119 happened is because the time was right. There was a captive audience (at CAST), a presentation was given (regarding 29119 opposition), the response was observed and the opportunity taken. And the petition was born. Granted this is an over-simplified timeline, however, based on the transcripts of roundtable discussions I have read its all based on facts. What about us free-thinking testers that welcome input from all schools? I for one choose not join any particular school of thought. I am a free-thinking tester that believes that testing has always been a human function and based on context. In fact everything we do, as humans, is based on context! I also welcome any structure or process offered by an organization or individual (standard or not), why? Because if we truly believe that testing is based on context, then obviously one must keep an open mind to _ALL_ approaches, processes and methods. Further, I think that opposing a specific approach, process or method limits our ability as a tester and does not help our customer in the long run. This is why I have abstained from signing the #stop29119 petition and urge all folks in our profession to do your own research before signing. Ask yourselves how will this standard change the way I test? My answer is, if you believe testing is a human function and based on context, it will not. As free-thinking testers it is our responsibility to take charge of the direction we want our profession to head towards. It is my view that keeping an open mind and including everyone is the only way to stop this conflict and advance our profession. Everything has its place; standardization and certification as well as no standardization or certification. As context driven testers we should know when to choose each one. All this petition to #stop29119 is doing is polarizing testing and the members of our community. This goes against my values and my mission so I choose to abstain from signing the petition.